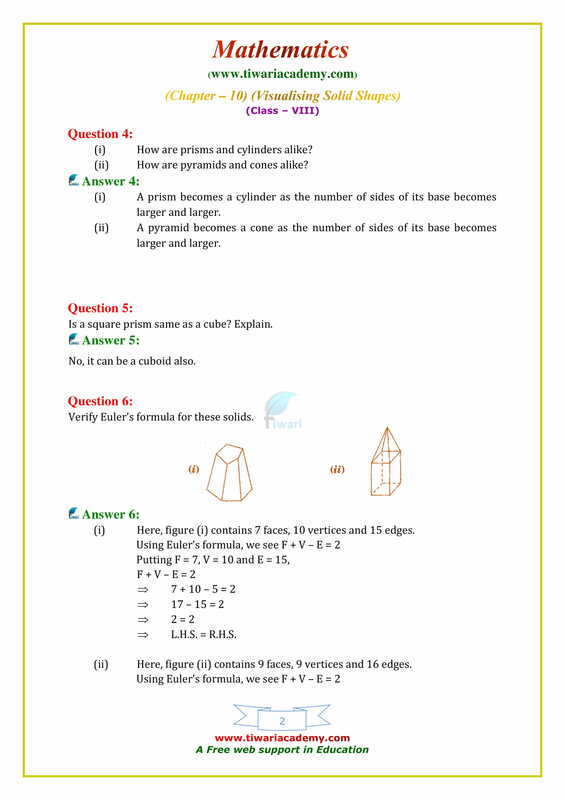 NCERT Solutions for Class 8 Maths Chapter 10 Exercise 10.3 Visualizing Solid Shapes in English Medium and Hindi Medium format free to study online. 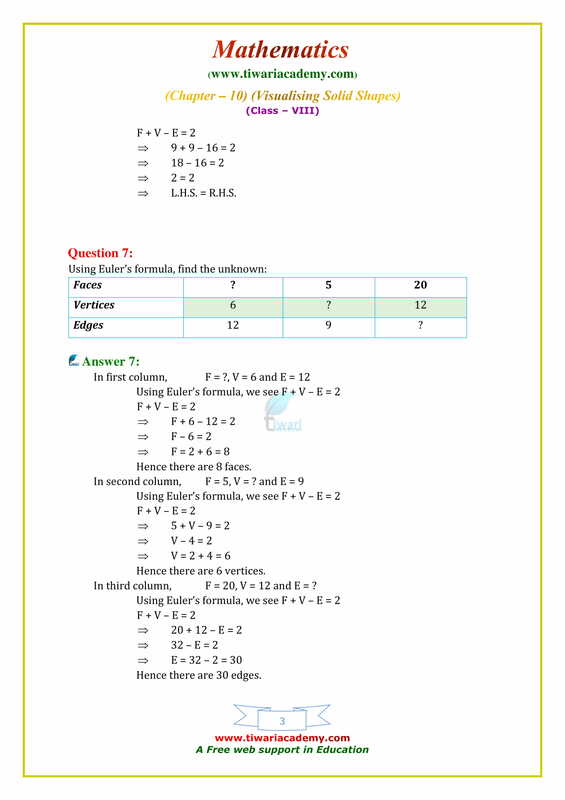 Solutions of the questions are prepared considering the latest CBSE Curriculum 2018-19. Draw a prism with its base as regular hexagon with one of its face facing you. Now draw the top view, front view and side view of this solid. Check whether a polyhedron can have V = 12, E = 6 and F = 8. Use isometric dot paper to draw each figure. (a) A tetrahedron. (b) A rectangular prism with length 4 units, width 2 units and height 2 units. How many vertices does each of the following solids have? A polyhedron has 20 faces and 12 vertices. Find the edges of the polyhedron. The actual width of a store room is 280 cm. If the scale chosen to make its drawing is 1:7, then the width of the room in the drawing will be 40 cm. Draw a map of your school playground. Mark all necessary places like 2 library, Playground, Medical Room, Classrooms, Assembly area, etc. Find the scale: (a) Actual size 12 m. Drawing size 3 cm. (b) Actual size 45 feet. Drawing size 5 inches. Suppose you know the area of the base of a cylinder and the height of the cylinder. How can you find the cylinder’s volume? The base of a cylinder is a circle with radius r. How can you find the area of the base? How can you use this in your formula for the volume of a cylinder?